As one of the few startups backed by Ratan Tata, Bluestone garnered enough attention in 2014. It didn’t disappoint him, though. The startup has since emerged as the second largest online jewellery firm in India, after Caratlane. It designs, manufactures and sells jewellery under its own brand. Having recently raised Rs 200 crore, Bluestone is striving to maintain its growth trajectory. What has Bluestone been up to, in the last year? Playing catch up with the bigger rival Caratlane. Bluestone’s revenues were one-sixth of Caratlane’s in FY 14. Closing the gap a bit, it earned revenues that equalled half of its rival’s in FY15. It continued with its desperate chase in FY16. Compared to Caratlane’s Rs 141 crore revenue, and Rs 63 crore loss, Bluestone clocked revenue of Rs 103 crore, and a loss of Rs 70.5 crore. And amidst all of this, the relationship between the two companies changed, well sort of, in a step-brotherly way. Earlier in May, Tata group company Titan Co. Ltd. bought 62% stake in Caratlane for Rs 357.2 crore. This took the competition between the two to a new level. A couple of months later, Bluestone raised Rs 200 crore in funding from IIFL and Accel, with participation from IvyCap Ventures, Kalaari Capital, and RB Investments. As of date, in India, 50-65 million is the total number of people who shop online. A much smaller number of people are willing to buy jewellery on the internet. Overall, online jewellery retail is not even 1% of India’s $60 billion offline jewellery retail market yet. The potential to grow in this space is enormous, and companies like Bluestone and Caratlane are all set to cash in on it. The battle for dominance in India’s online jewellery market is just starting. Rs 103.4 crore: Revenues Bluestone earned in FY16. A 72% jump from FY15, when it clocked Rs 59.8 crore in revenues. Rs 98.09 lakh: Is its forex earnings. Not even 1% of total revenues yet. Rs 12.5 crore: Is what the company lists as expenditure in foreign currency. The amount spent outside India. On marketing, advertising, raw materials, technology, communication and software expenses. Rs 35.5 crore: Total money the company spent on advertising and marketing. Up from Rs 28.9 crore it spent in FY15. Rs 25.3 crore: Is what company paid in salaries to its employees. Up 1.5 times, compared to Rs 9.8 crore in FY15. Rs 68.9 lakh: Salary for Gaurav Singh Kushwaha, the CEO and founder. He gave himself a 32.2% hike over FY15. 3.2x: Is the jump in commission paid to agents selling Bluestone jewellery, to Rs 37.3 lakh. 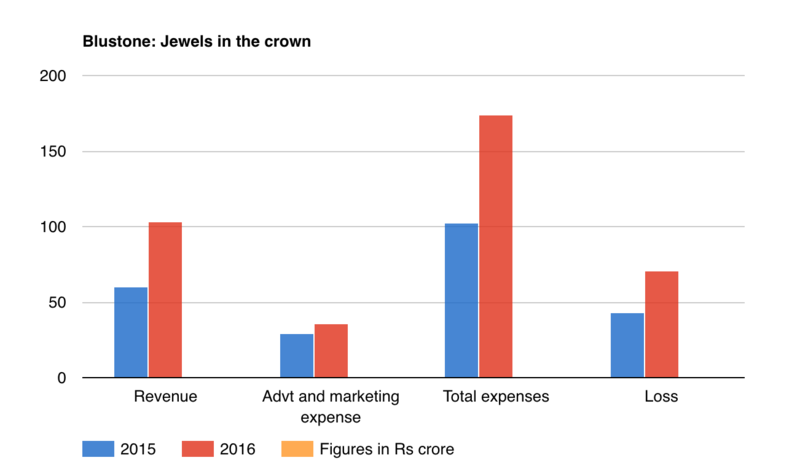 Rs 174 crore: Is the total expenses the company bore in FY16. Almost 70% hike compared to FY15. Rs. 70.5 crore: Losses the company incurred in FY16, compared to Rs 42.8 crore it recorded a year ago. While revenues grew 72%, losses rose almost 65%, keeping pace with each other. Rs 12.14 crore: the cash and cash equivalent the company had as on 31 March 2016. 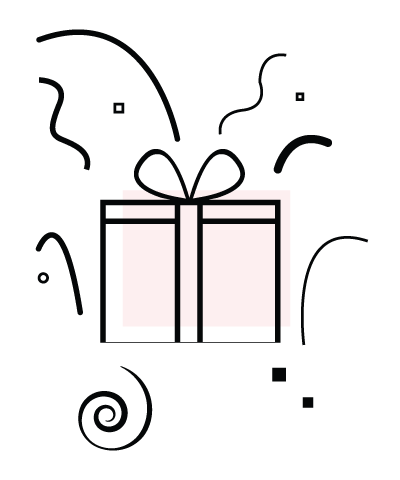 New Age E Commerce Services LLC: The entity incorporated by Bluestone in the state of Virginia, United States of America. There have been no transactions with and by the entity so far, according to auditor’s note.